If the occurrence of a risk situation in the industrial production process and / or control of the territory, the system also serves to provide support for the preparation of response plans, developing and integrating, for example, data from affected areas with those of the surrounding car traffic in order to be able to provide useful information to the population and relevant authorities. The project includes significant field-testing activities with particular emphasis on integrated management of environmental and industrial risk situations. 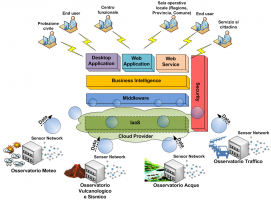 The objective is to demonstrate, with the help of some use cases oriented to territory multi-risk management, that the "systematization" of infrastructure that are not interoperable today, produces add value both for those providing the resources (sensors, data, calculation ) and for the users, making it possible to offer services with high added value.